If you believe everyone should have a home, you will share the vision of Shelter, the charity that works to alleviate the distress caused by homelessness and bad housing. They provide free, confidential advice to people with all kinds of housing problems through online information and face to face local services. Shelter tackles the root causes of arising situations by lobbying government and local authorities for new laws and policies, and more investment to improve the lives of the less fortunate. Their influential campaigns deliver their message to the media and the public, who are a great asset in the fight for solutions. Shelter employs more than 1,000 people across Britain, and enjoys the support of many volunteers. Their staff gives advice and help to more than one million people a year via their website, help lines and national network of services. The charity is divided into different sectors that work together to come up with life changing solutions. When a problem is identified by the Services Department, it is passed on to the Policy and Research Team that will build a picture of the situation nationally then recommends new laws and policies to overcome them. The Campaign Team works to gain maximum support from MPs, companies and the general public while Services find ways to cope with the problem in the short term. 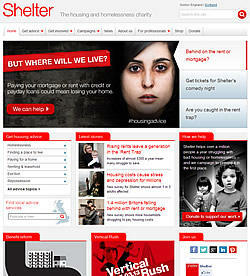 Under pressure from Shelter`s campaigning and lobbying efforts the government announces change. The bulk of Shelter's funding comes from donations made by individuals, organizations, charitable foundations and businesses. From running marathons to organizing music nights, individuals and organizations take part in a wide range of fundraising activities for Shelter. You may even come across their face to face fundraising team who are searching for new supporters who wish to donate through Direct Debit. This is a very cost effective way of raising awareness and generating income for the charity. Shelter has come a long way and with your help the charity will give relief and the hope of a better life to thousands in need.